Many people have used EFT successfully on physical issues like rashes, headaches, sore throats, and similar problems. Sometimes we can tap directly on the physical problem, creating a setup statement with the words, for instance, "This migraine." However there are often emotional factors underlying our physical symptoms, and it's usually much more fruitful to dig for these. You might try tapping on the physical problem first, or you could search for the emotional problem first. If you're an experienced EFT practitioner, you'll probably work with your clients' emotions, even if you believe they might be resolved by physical tapping, because it's an excellent way to dramatized the contribution emotional factors make to our physical symptoms. A key question to ask if a physical ailment doesn't yield to tapping is: "What emotional experience might underlie this physical issue? Sometimes a client will immediately describe one. A client might say something like, "These migraines began just after my husband asked me for a divorce." Other times, a client is unable to come up with any emotional experience associated with the symptom. In these cases, ask them to guess. These guesses are usually close to the target. One young man in an EFT workshop could not identify any emotional event linked to his migraine headaches, but had a word that triggered him: "injustice." We asked him to make up an event, and asked who might have said words of injustice to him, or been a headache in his early life. "My mother," he replied. "What might she have said?" we asked. "You can't have what you want," he told us. We asked him to visualize her face, and asked how old he was. He replied that he was eight, and his mother was telling him he could not use his yellow bicycle. He'd saved up and bought the bicycle with his own money, and when he transgressed, his mother wouldn't let him use it. These questions helped him evolve from a guess, to an actual event, to an emotional contributor to his migraines. Once he tapped on the event, the migraine headache that had developed during the EFT workshop went away. 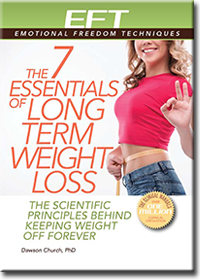 While it's possible to get some success tapping on physical symptoms alone, don't stop there. 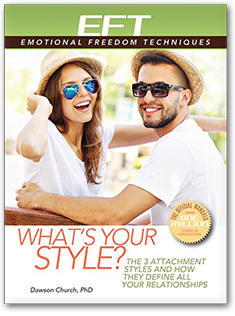 Find the underlying emotional issues, and you'll usually have long-lasting success with EFT. 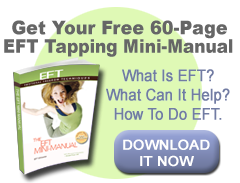 I have decided to use EFT to try and heal my asthma. I, according my mother, have had it all my life. I was born five months premature and suffered numerous issues involving my lungs because of it. I contracted phenomena four times in a year as an infant. I was also constantly taken on and off of my breathing machine as an infant, too, which, caused a series of crashes (I stopped breathing numerous times after I was taken off of the breathing machine. Now, as a 19-year-old, my lungs, even if I am not having an asthma attack, can only receive 80% of the normal oxygen levels. I hate being dependent on my steroid medication to breath. I have tried to go off of them twice only to relapse and have an asthma attack that lasted for weeks. I've - tried to do EFT tapping for my falling her - I did it for over a week - 7 rounds but no success. What advice can u give?